Hershey’s makes delicious salted caramel chips which are available in our area only during the Christmas season. I buy three or four bags and squirrel them away for use during the year. This is a blonde brownie that I have made in various ways, made even more delicious with these chips. Of course, any kind of chips would be fine – dark or milk chocolate, butterscotch, peanut butter, etc., but the salted caramel version gives a special flavor to these easy-to-make bars. 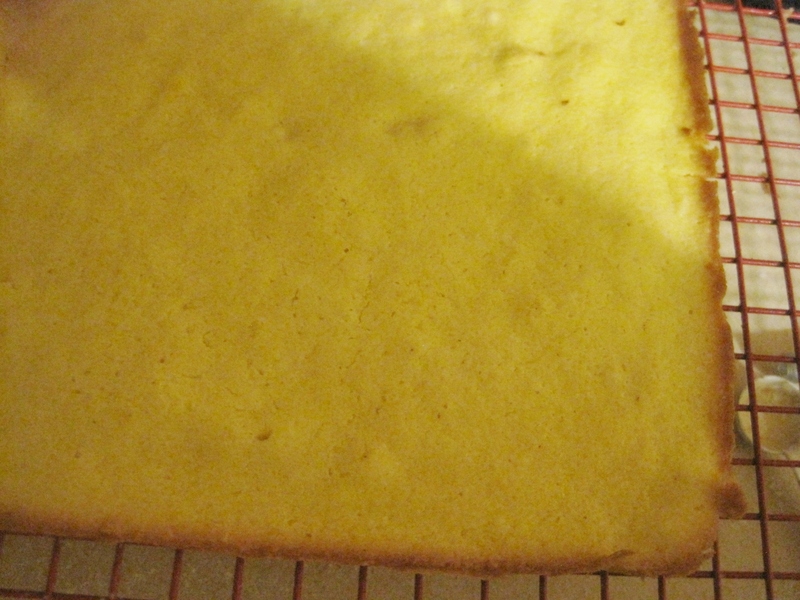 9 inch square pan, lined with parchment paper. In a large bowl, whisk together the eggs, sugars, oil and vanilla. Whisk in the baking powder and salt. Stir in the flour, chips and pecans just until blended. Spread in prepared pan. Dampening your fingertips will help spread the batter in the pan. Bake for 30 minutes at 350 degrees F until top is light-golden brown – don’t overbake. Let cool in pan for 5 minutes, then remove by lifting parchment paper and cool on wire rack. 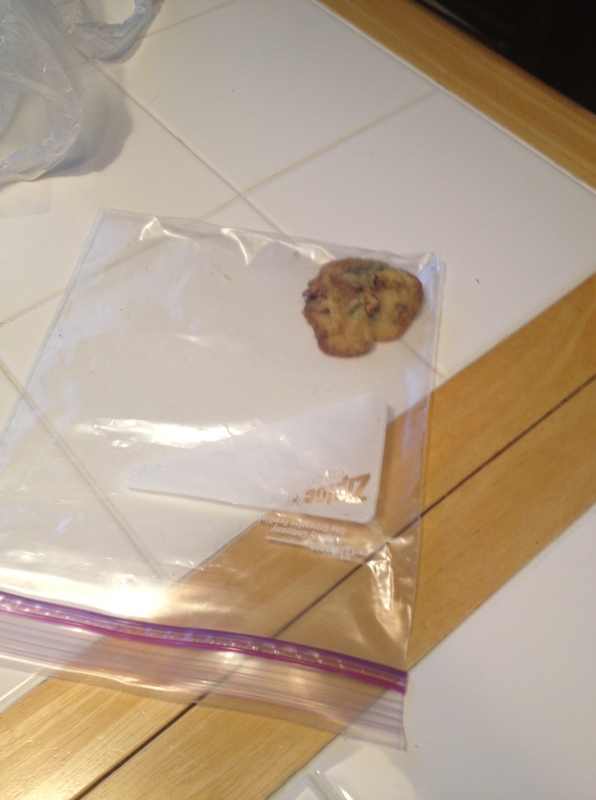 Tip: Before cutting, remove parchment paper and place it under the rack for easy cleanup of crumbs. I adapted this recipe from one on epicurious.com several years ago and it has become a family favorite. The shortbread would be great just by itself, but teamed with a layer of apricot and walnut filling plus a light dusting of confectioners’ sugar, it is simply delicious. It’s easy to make with no mixer required. In a 9×9 inch baking pan, place the flour, sugar and salt, stirring with a fork to mix. Add the butter and with your finger press the butter into the dry ingredients and then spread the dough in the pan, pressing down to flatten and smooth it out. 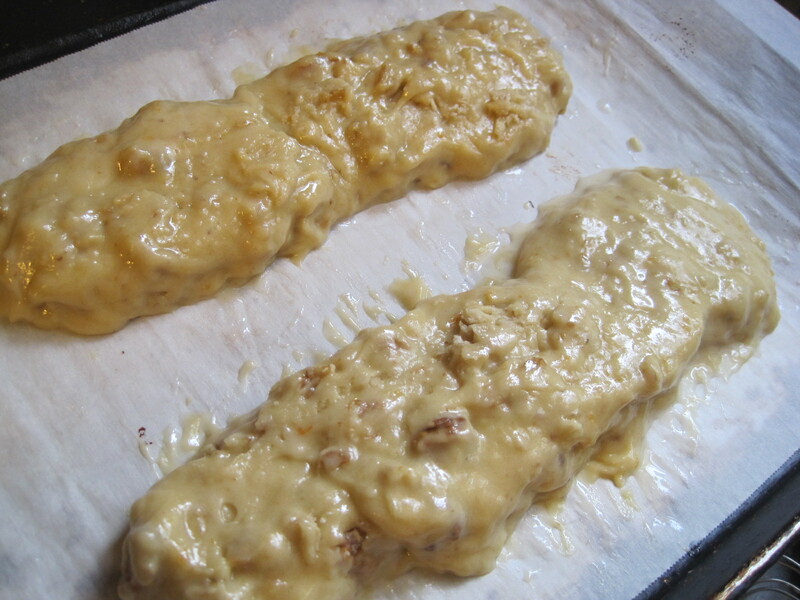 Bake for approximately 25 minutes until top is light brown. Remove from oven and set on rack. 2/3 cup dried apricot halves (about 4 oz.) coarsely chopped – place in small pan, cover with water and boil until soft – about 4 minutes. Drain and set aside. In a medium sized bowl, whisk the eggs, whisk in the brown sugar, baking powder, salt and vanilla. Stir in the flour, walnuts and apricots. Pour this mixture on top of the baked shortbread. Bake in preheated 350 degree oven for approximately 35 minutes until top is puffy and dark brown. Cool on a rack for 10 minutes. Cut into portions and lift onto a rack that has been placed on top of a baking sheet. Allow to cool thoroughly. Note: I cut mine into 8 portions which turned out to be large servings of a rich dessert. Cutting the shortbread into 12 squares might be better. After cookies are cool, spoon confectioners’ sugar into a fine strainer and lightly sift over the bars. At Christmas time, I found Hershey’s Sea Salt Caramel Chips which were new to me and put them aside while I was baking my standard Christmas favorites. My daughter and I were going to attend an Appalachian “Ringin’ in the New Year” event and something was needed for potluck dinner. There never seem to be enough cookies for children at these dinners, so I thought I would try out the new chips. There was a recipe on the package which may be very good but it was for a chocolate cookie and I wanted a vanilla cookie that would be easy to pick up, not crumbly and that would not spread out too much. 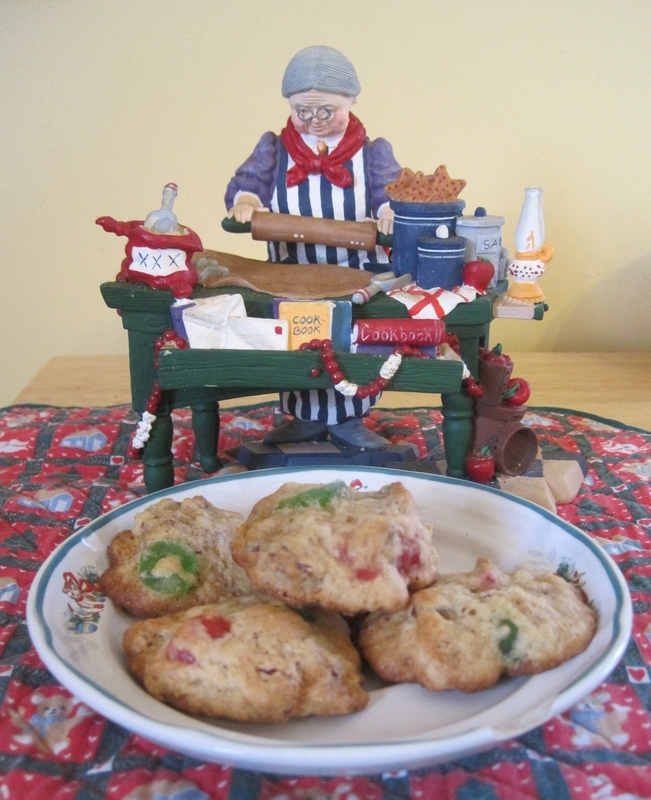 I adapted the recipe to meet these requirements and thought the cookies were delicious. My younger daughter is not given to lavish praise and when she rated them “fabulous”, I figured I had a winner. They went very fast at the dinner. 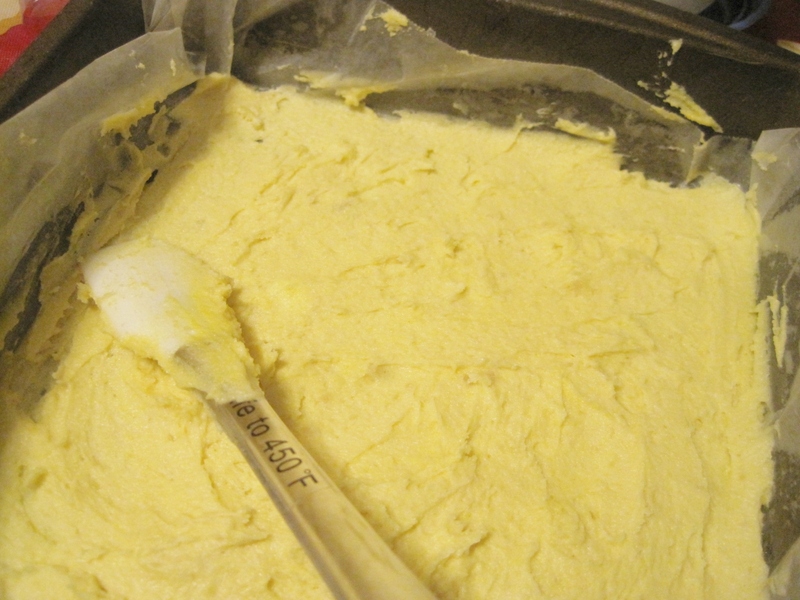 In a large mixer bowl, cream the butter/margarine, brown sugar and granulated sugar. Beat in the vanilla, soda, salt and egg. Gradually add and mix in the flour and chips. 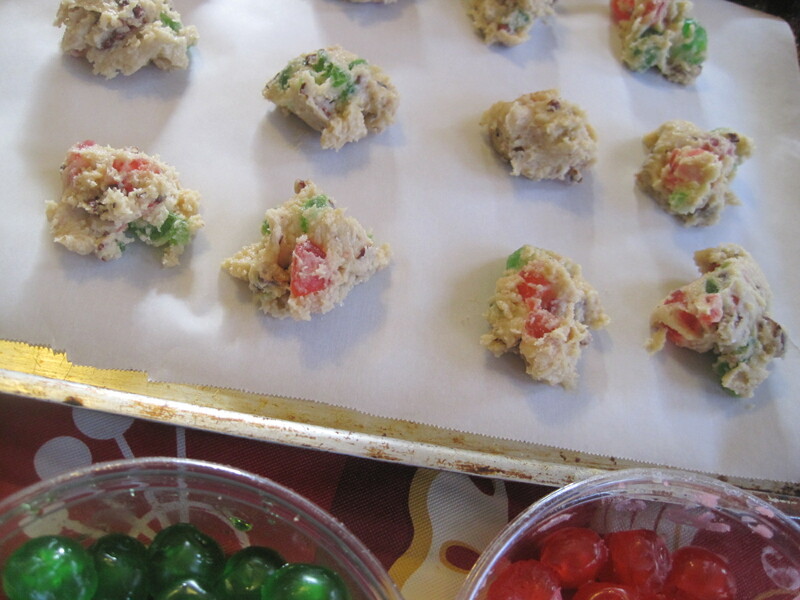 Drop by tablespoon onto parchment covered baking sheets and flatten cookies very slightly. Bake in a preheated 350 degree oven for approximately 9 minutes until cookie is set. Do not overbake. Cool slightly, remove to wire rack to cool. 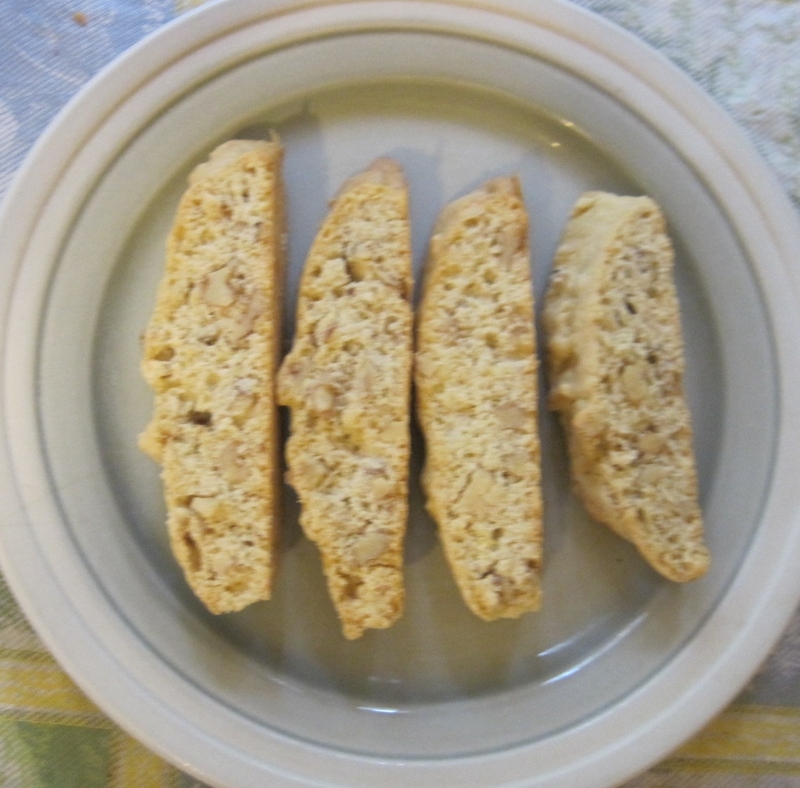 I like this biscotti better than any I have had in a bakery or coffee shop. 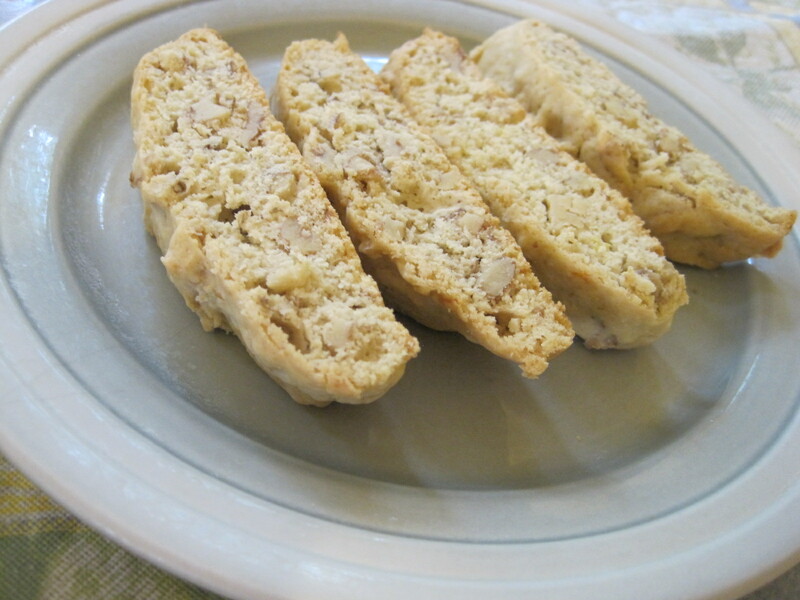 They are not too sweet, have a light orange flavor and a lot of crunchy walnuts, and are very easy to make. Everything is mixed by hand in one bowl – no mixer – and takes just a little handling to form. The dough is divided and plopped in big globs on a parchment-lined cookie sheet to make two piles. Then, with water-dampened hands, the dough is formed into two rustic-looking logs. The slow baking takes a little time – 25 minutes @ 300 degrees F and then 30 minutes @ 275 degrees to make the crispy slices. I enjoy these very much just as a quick snack (they travel well) or dunked in tea or coffee. In a large bowl, whisk together the olive oil, sugar, orange extract, orange peel and 2 eggs. Whisk in salt and baking powder, then with a spoon, stir in the flour and chopped walnuts until blended. Spoon half of the batter onto one side of the prepared baking sheet, making a rough cylinder. Spoon the remaining half of batter onto the other side of the baking sheet, making a rough cylinder. With water-moistened hands, form each cylinder into a a log about 12 inches long x 2 inches wide, allowing a space between the two logs. Bake @ 300 degrees F for 25 minutes until dough is just cooked through and lightly browned. Remove from oven and let cool for 10 minutes. REDUCE OVEN TEMPERATURE TO 275 DEGREES F.
Remove each loaf to a cutting board and with a serrated knife, cut diagonally into ¾ inch wide slices. Place the slices on their sides on a rack that has been placed on the baking sheet. Leave a little space between slices. Bake @ 275 degrees F for 15 minutes, turn slices to the other side and bake for another 15 minutes. 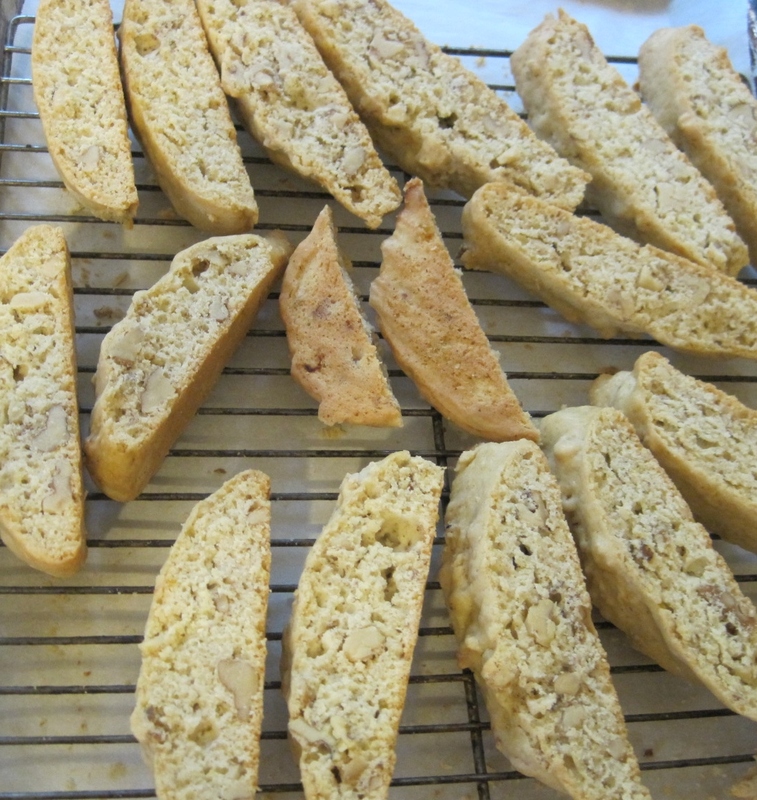 Biscotti should feel dry and be golden brown. Remove rack from pan and allow to cool completely. In 1952, I was working at Procter & Gamble’s corporate offices in downtown Cincinnati. I was a secretary in the Radio/TV Advertising Department and worked for the two department heads plus three young members of the staff. 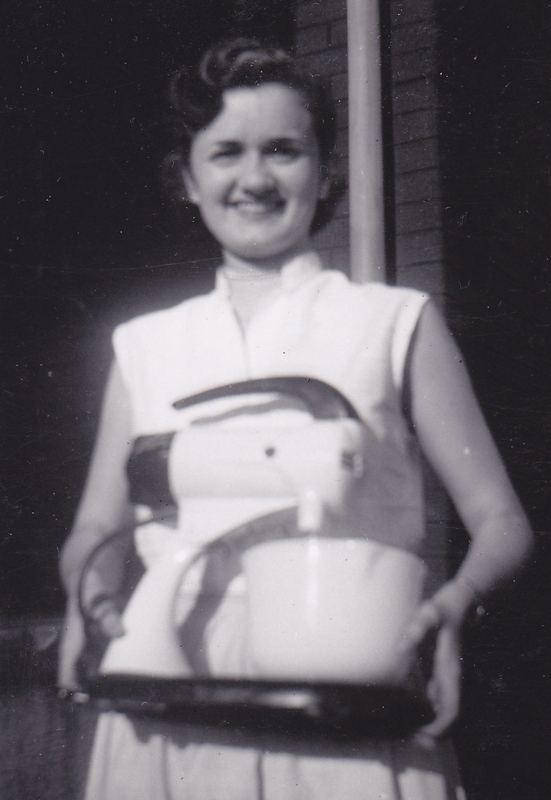 On May 31, 1952, early in the morning of the day I was to be married, a special delivery letter arrived. 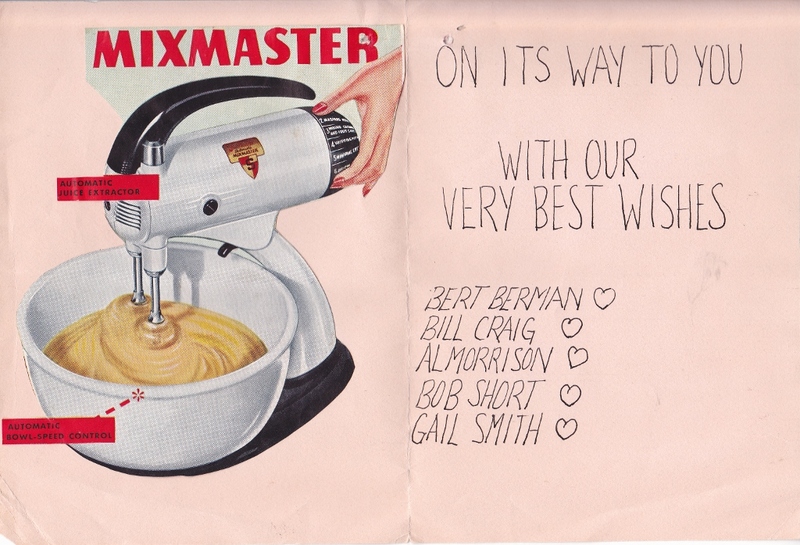 It contained a cute page made up by my co-worker, Bert Berman, had the signatures of the rest of the men in the department and informed me that I was going to be receiving a SUNBEAM ELECTRIC MIXER. 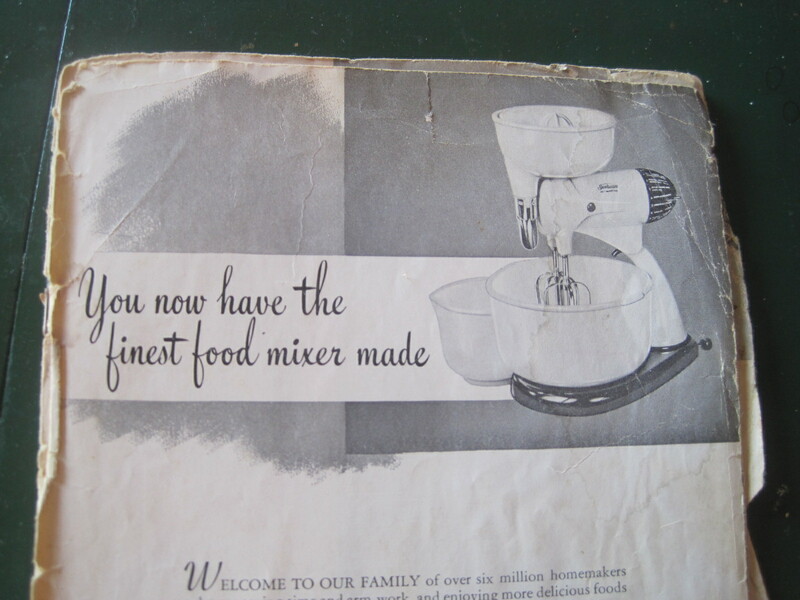 I was completely surprised since Mr. Smith and Mr. Craig had already sent beautiful sterling silver pieces, but there was nothing I wanted more than an electric mixer. The manual/cookbook that came with the mixer was my baking bible for the next ten years at least. It’s in tatters now with the cover and a couple of pages missing. I made a lot of good food with that Sunbeam and manual. 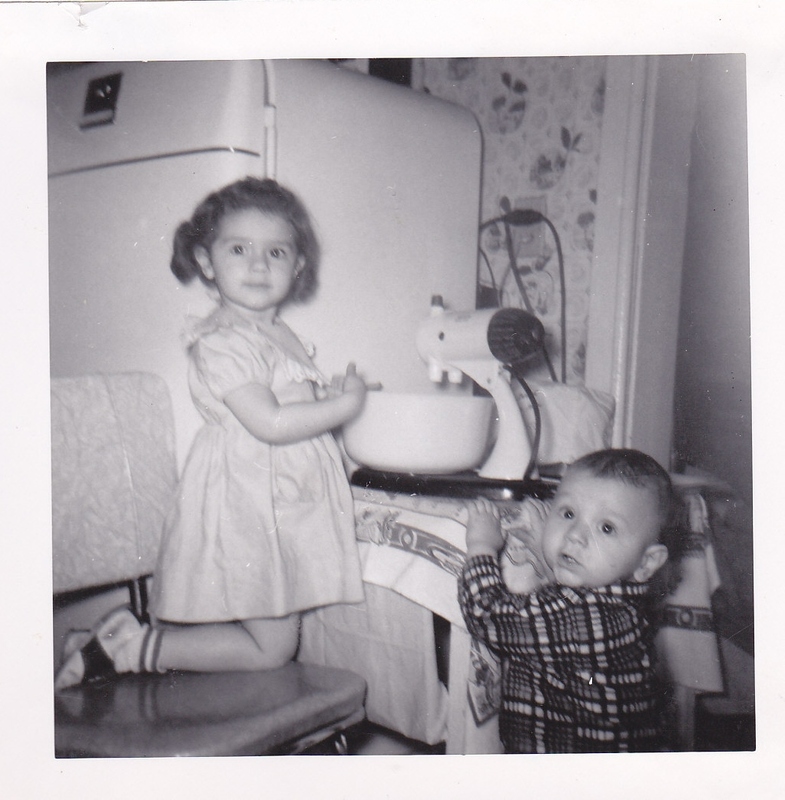 This is a picture of my older daughter and son, waiting for me to start mixing his first birthday cake in 1957. 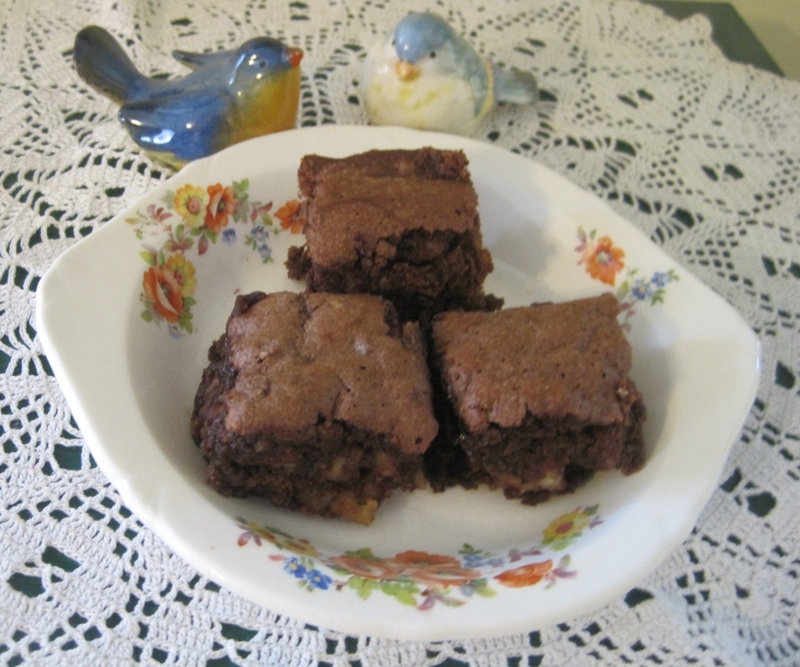 One of the family’s favorites was an easy recipe for brownies. I named them my “Best Brownies”, copied from my recipe binder below. Sift together the flour, baking powder, salt, sugar. Add shortening, vanilla and eggs. Beat one minute, then add the cocoa and nuts. Pour into greased 8×8 pan. Bake @ 350 for 30-35 minutes. Cut while still warm. 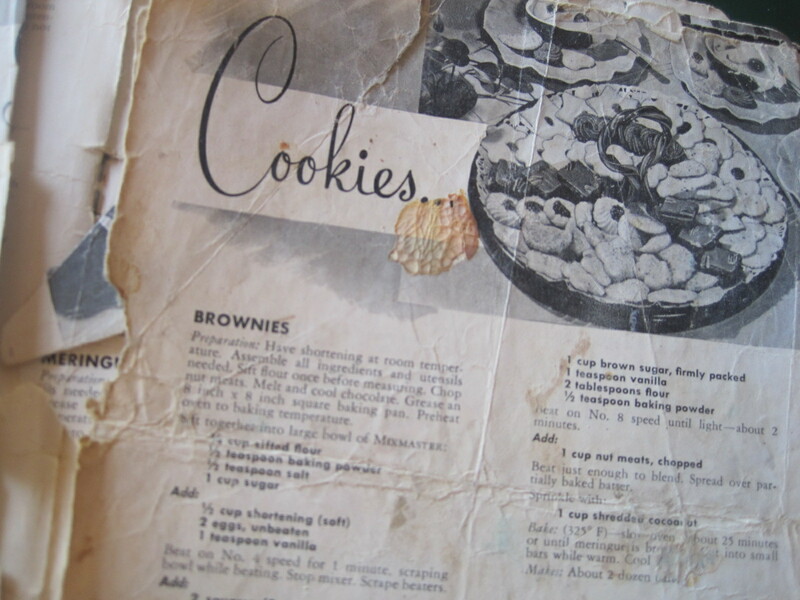 Old 1950s recipe from original Sunbeam mixer cookbook. Have made a thousand times. Saying that I have baked these brownies 1,000 times over the past 60 plus years isn’t too much of an exaggeration. I made up a batch today just for old time’s sake. My Sunbeam mixer lasted 30 years until 1982. By that time, I was doing a lot of bread baking and wanted a very strong unit along with dough hooks. I chose a Kitchen Aid mixer which is still working beautifully 33 years later. It has served me well, but has never given me the surprise and thrill of that first old Sunbeam. 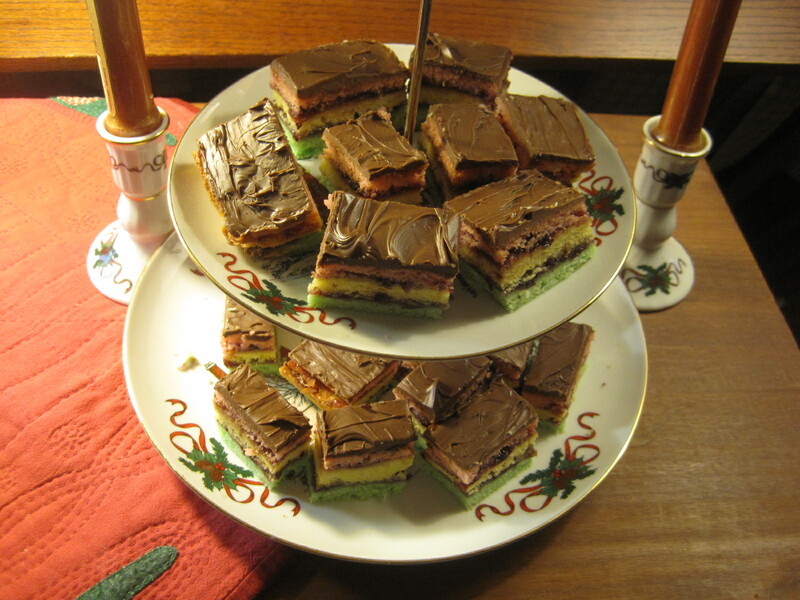 I first saw this recipe in a 1986 Family Circle Christmas Helps magazine. I adapted the recipe somewhat and made them for Christmas that year and in 1988, they won a blue ribbon at the Hamilton County (Cincinnati) fair.They are not difficult to make and the dough is easy to handle, but they do take a bit of time especially if you don’t have three 9×9 pans for baking the three layers (which I don’t). I used one pan, rinsed it out, re-greased and paper-lined it and used it again for the remaining two layers. 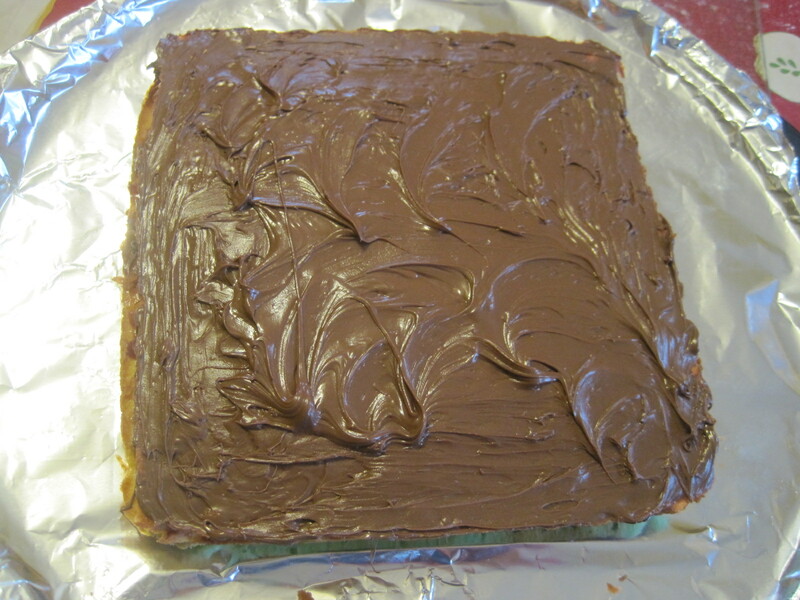 You could also use three round layer cake pans (which I do have but wanted this to be square). 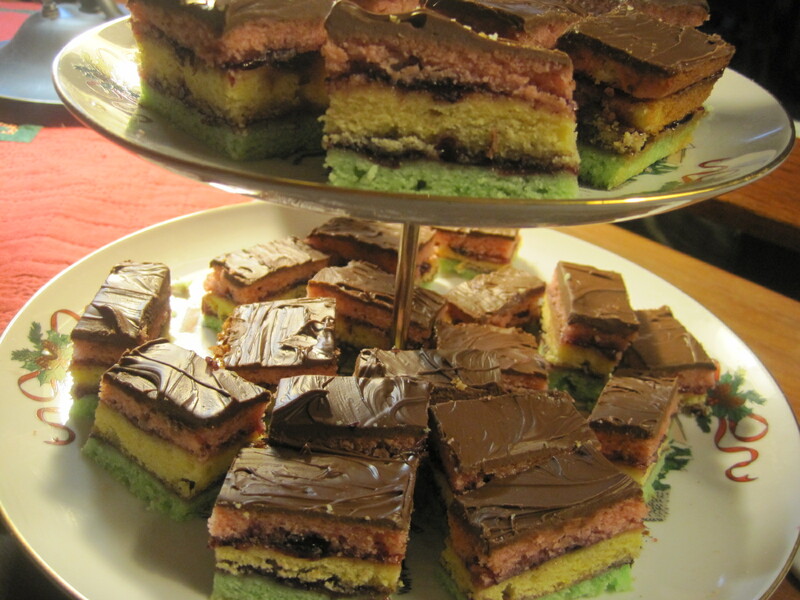 They make a festive almond-flavored cookie bar with three layers of colors, the taste boost of your favorite jam or jelly and a thin chocolate topping. 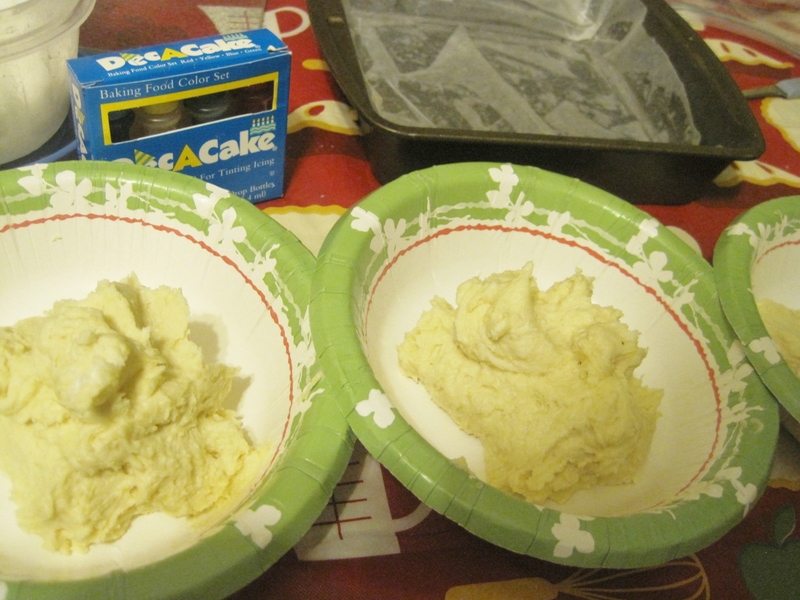 Grease and then line with waxed paper 9-inch baking pans or layer cake pans. In the large bowl of a mixer, place almond paste, sugar and butter. Beat until creamy and smooth. Add eggs and almond extract, beating to blend. Add flour, beating just until flour is absorbed. Dough will be soft. Divide dough between three bowls. This is one time I use paper bowls for easy clean-up. To one bowl add 3 drops of yellow food coloring, and 3 drops of red and green to the other two bowls. Mix each bowl to a pale color. Spoon the tinted dough into the three prepared pans and bake @ 350 degrees for 15 minutes. Using the waxed paper, lift each layer onto a cooling rack. Let rest for 5 minutes, then remove the waxed paper and allow the layers to continue cooling. 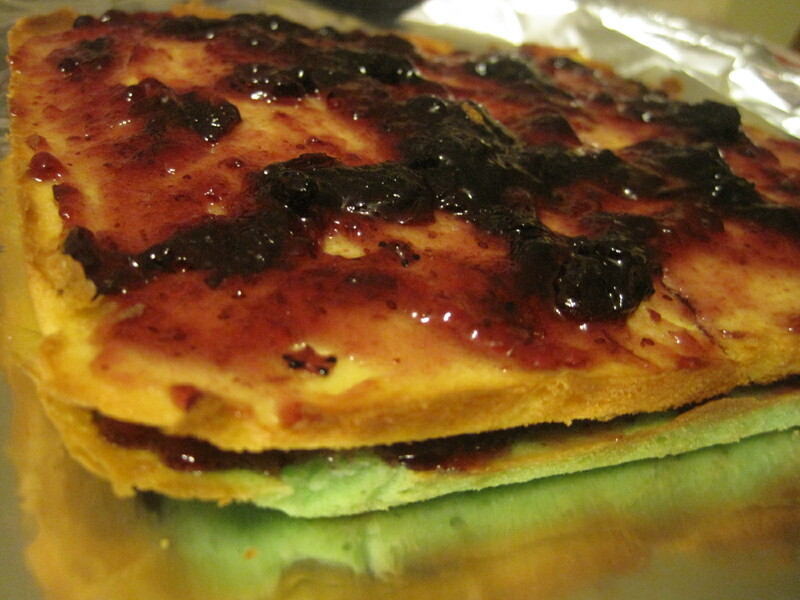 Place the green layer on an aluminum-foil-lined pan or plate and spread the top with 3 Tblsp. 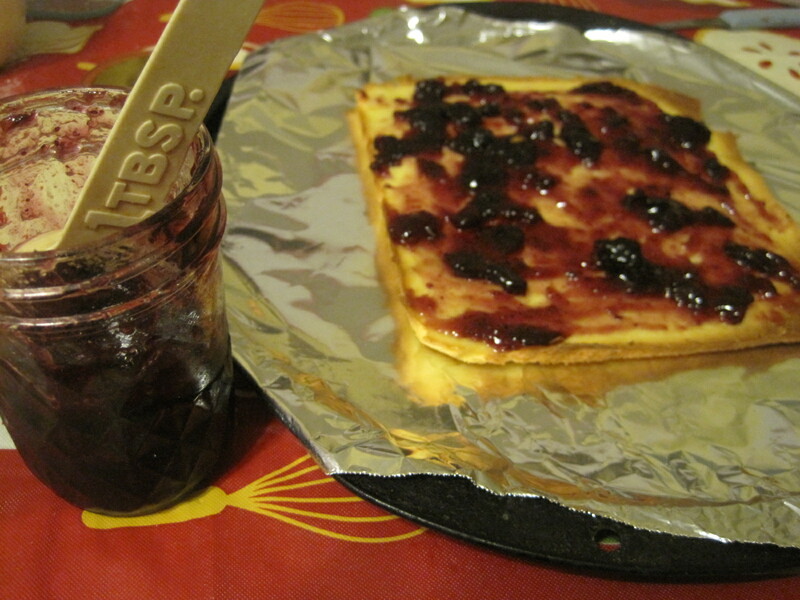 jam/jelly. Place the yellow layer on top of the green and spread 3 Tblsp. Jam/jelly on the top. 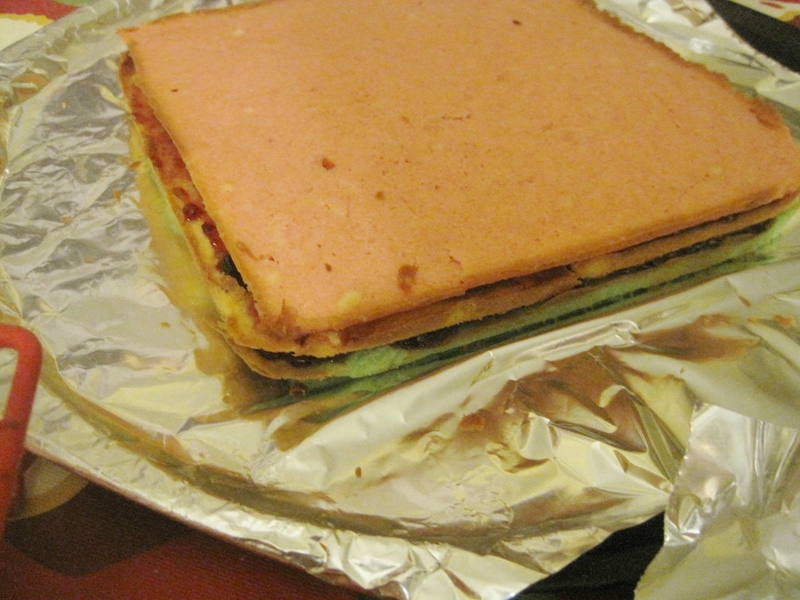 Place the red layer on top of the yellow layer. Cover with foil and weight with a large book. Place in refrigerator overnight. 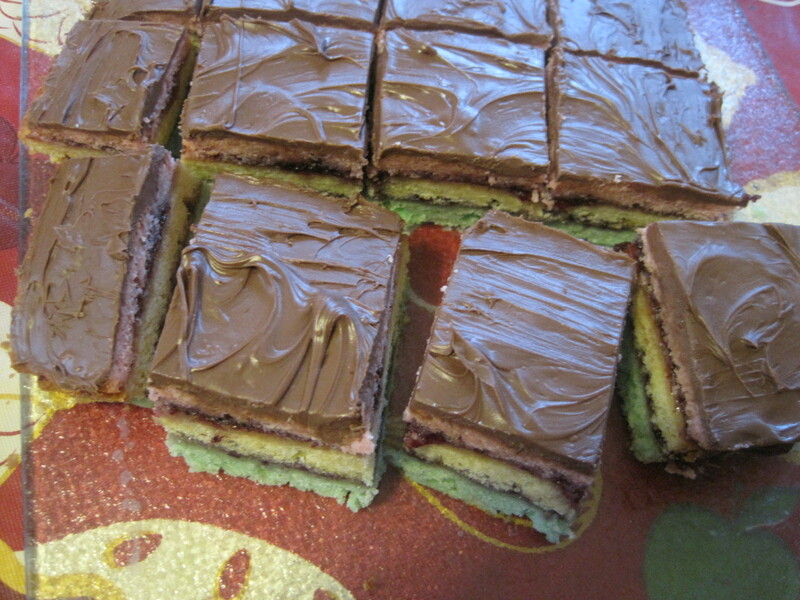 The next morning, melt chocolate chips and spread over the top pink layer. Allow to set for 10-15 minutes and then cut into squares or bars. My daughters and I love fruitcake but don’t want to indulge too often in this rich treat (we’ve already enjoyed two good fruitcakes this season). 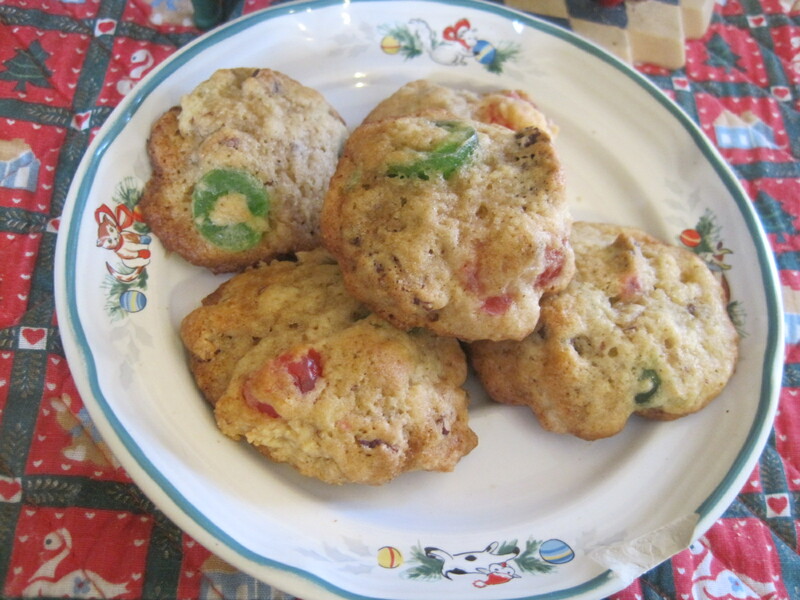 I adapted this recipe from one found on a candied cherry container label and we thought they were really good and not quite as bad as eating a slice of fruitcake. In the large bowl of an electric mixer, beat butter, granulated sugar and brown sugar until creamy. Add vanilla and egg and beat well. Add soda and salt, blending well. Add flour and mix just until flour is absorbed. Slowly beat in cherries and pecans. 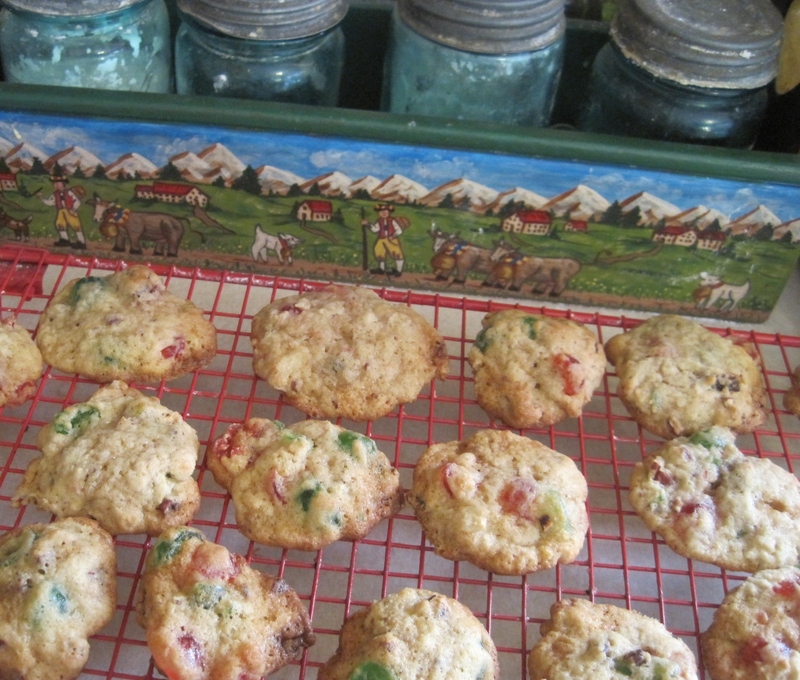 Drop by tablespoon onto cookie sheets, leaving about 2 inches between cookies. Bake @ 375 degrees F for 9 to 12 minutes until cookies are golden brown. Remove to racks to cool. I was surprised to learn that my 11-year-old granddaughter who doesn’t like anything had just about finished off the cookies.